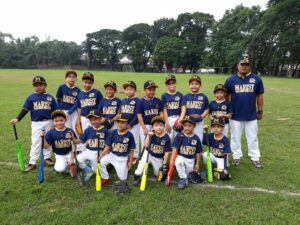 The Marist School Baseball Team is the champion in the Metro Schools Baseball and Softball League of the Philippine TOT Baseball Foundation (Pinto/Shetland Baseball Developmental Division) held last March 3, 2019 in Sto. Nino Field, Marikina City. The team had the most number of wins and no losses. The team is composed of Ocean Jackob Arroyo (Grade 1), Kreay Alecx Cruz (Grade 1), Azrael Lorenz Santos (Grade 1), John Arkin Gatdula (Grade 1), Gio Vittorio Tuazon (Grade 1), Avelin Blake Pasion (Grade 2), Gio Joaquin Muyco (Grade 2), Simon David Linco (Grade 2), Raygranth George Froyalde (Grade 3), Gillin Uince Tauro (Grade 3), Marco Antonio Argonza (Grade 3), Sean Kenneth Serrano (Grade 3), Fra Angelo Andrada (Grade 3). Mr. Sonny Pensaber is the coach of the Marist Baseball Team. Congratulations, Marist School Baseball Team, for your Marist-inspired achievement!